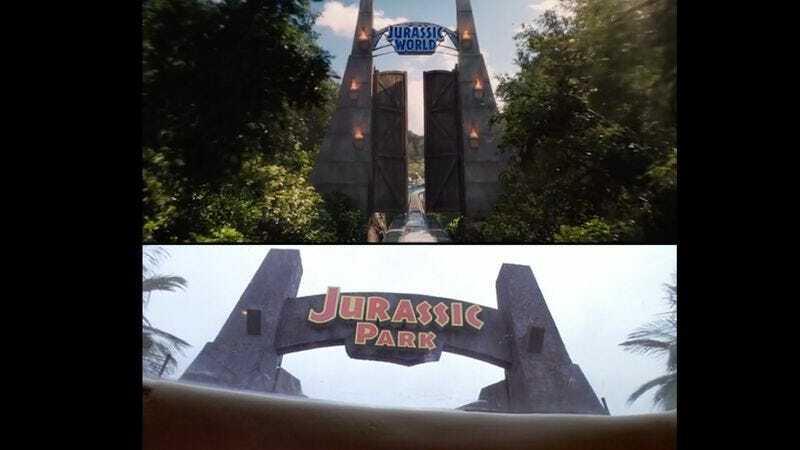 Whether they are Easter eggs or simple nostalgic echoes meant to remind audiences of a former film, Colin Trevorrow’s Jurassic World is filled with images that reference Steven Spielberg’s original Jurassic Park film trilogy. The result is a lot of moments that are meant to recall and perhaps piggyback on the splendor and emotional beats of that original film, while still paying significant homage to what has come before. Vimeo user WhoIsPablo (a.k.a. Pablo Fernandez Eyre, a director and editor in Los Angeles) has created this compilation that reveals the many times that Trevorrow references the early films, either in characters, shots, or scene composition. Much like Eyre’s previous Star Wars compilation, the question of intent is left purposefully ambiguous. Is this just a lazy way to tap into nostalgia and remind people of a better film? Or is this meant to be creating a more unified whole that revisits the same beats and shots, however in a slightly altered way? Eyre wisely leaves it up to the viewers to decide what is gained from all of these shared moments and callbacks. Jurassic World vs Jurassic Park Trilogy from whoispablo on Vimeo.